471 Beacon is located on the south side of Beacon, between Hereford and Massachusetts Avenue, with 469 Beacon to the east and 473 Beacon to the west. 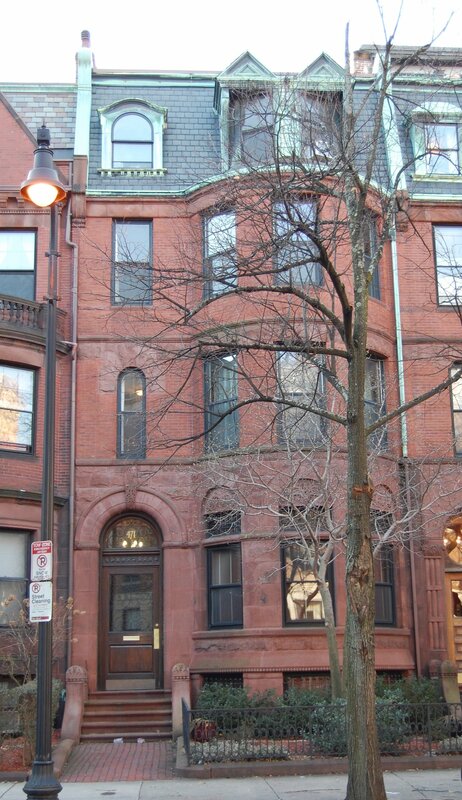 471 Beacon was designed by architect John H. Besarick and built in 1889 by David Rand, mason, for building contractor Samuel M. Shapleigh for speculative sale, one of two contiguous houses (471-473 Beacon). 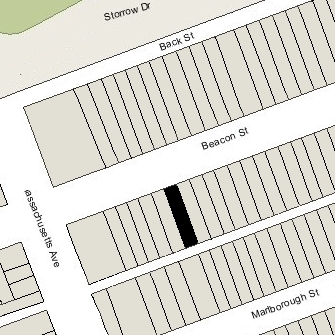 Click here for an index to the deeds for 471 Beacon, and click here for further information on the land on the south side of Beacon between Hereford and Massachusetts Avenue. On February 28, 1890, 471 Beacon was purchased from Samuel Shapleigh by Maria B. (Handy) Basset, the wife of banker and broker William Basset. They previously had lived at The Tudor (northwest corner of Beacon and Joy). They continued to live at 471 Beacon during the 1892-1893 season, but moved thereafter to Arlington. On June 20, 1893, 471 Beacon was purchased from Maria Basset by attorney Henry Gilman Nichols. He and his wife, Elsie (Quincy) Nichols, made it their home. They previously had lived at 34 Fairfield. They also maintained a home in Magnolia. He died in May of 1900, and Elsie Nichols moved thereafter. During the 1900-1901 winter season, 471 Beacon was the home of Philip Shelton Sears and his wife Mary Cabot (Higginson) Sears. He was a lawyer and trustee, and later would become a noted sculptor. Earlier in 1900, they had lived at 166 Marlborough, and by the 1901-1902 season they had moved to 4 Gloucester. 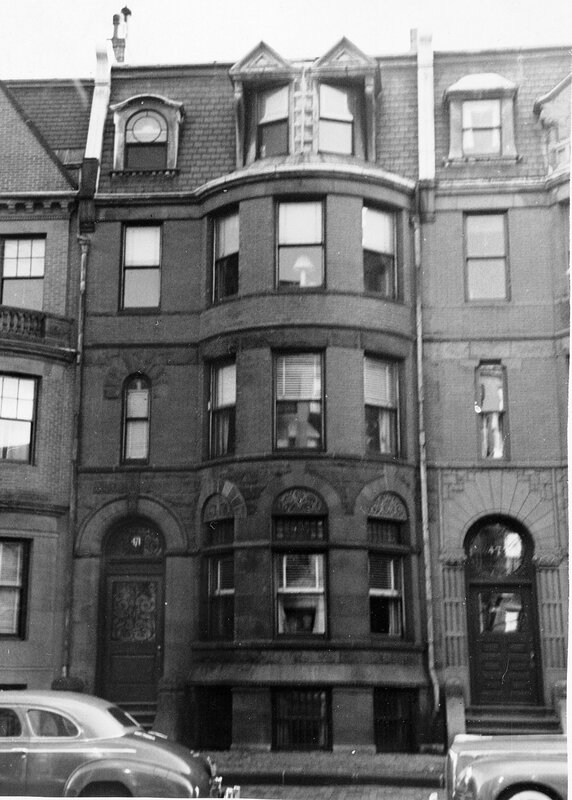 During the 1902-1903 winter season, 471 Beacon was the home of Thomas Sherwin and his wife Isabel Fiske (Edwards) Sherwin. Their primary residence was at 10 Revere in Jamaica Plain. They later would live at 150 Commonwealth. Thomas Sherwin was president of the New England Telephone and Telegraph Company. He had served as an officer in the Civil War and was brevetted a brigadier-general, U. S. Volunteers, for gallantry at Gettysburg and for meritorious services during the war. On July 13, 1903, 471 Beacon was purchased from Henry Nichols’s estate by Caroline M. (Perry) Jones, the wife of Benjamin Mitchell Jones. They previously had lived in Belmont, where they continued to maintain a home. Benjamin Jones was an iron and steel manufacturer and merchant. Benjamin Jones died in November of 1915. Caroline Jones continued to live at 471 Beacon until her death in December of 1925. After 1926, the house no longer was listed in the Blue Books. On January 28, 1928, 471 Beacon was acquired from Caroline Jones’s estate by Edith Weinstein, and on February 15, 1928, it was acquired from her by real estate dealer Joseph P. Brennan. On October 1, 1928, 471 Beacon was acquired from Joseph Brennan by John A. McLeod. In February of 1929, he filed for permission to convert the house from a single family residence to an eight family residence, also submitting an affidavit that it would remain a “one-family apartment house” as long as he was living there. He subsequently abandoned the permit. On December 18, 1929, 471 Beacon was acquired from John McLeod by Thomas P. Daly. On March 27, 1929, John Edwin Watkins, trustee for the benefit of William E. Watkins, foreclosed on a mortgage he held on 471 Beacon and took possession of the property. On January 30, 1930, 471 Beacon was acquired from John Watkins by Hugh A. Carney, an attorney, who lived in Arlington. By 1931, 471 Beacon was the Phi Lambda Alpha (MIT) fraternity house. It continued to be located there in 1932. By 1933, it was the Phi Iota Alpha (MIT) fraternity house. The property was shown as vacant in the 1934 and 1935 City Directories. On October 31, 1935, Thomas F. Reddy foreclosed on a mortgage he held on 471 Beacon and sold the property to Mary L. McGill of Somerville. On April 4, 1936, 471 Beacon was acquired from Mary McGill by George Bernard Rittenberg, trustee of the Sumner Realty Trust. In April of 1936, he filed for (and subsequently received) permission to convert the property from a single-family dwelling into nine apartments. In May of 1936, he filed an amendment, reducing the number of apartments from nine to five. On January 21, 1947, 471 Beacon was purchased from George Rittenberg by Chester C. Fredberg and his wife, Celia (Ceil) (Koblintz) Fredberg. He was corporate clerk and later a salesman with the Great Northern Finance Company. They lived in one of the apartments at 471 Beacon. In February of 1957 they acquired 461 Beacon, and December of 1958 they acquired 477 Beacon. He retired in about 1963, and they sold both 461 Beacon and 477 Beacon in September of 1979. They continued to live at 471 Beacon until their deaths, his in March of 1984 and hers in June of 1997. After Ceil Fredberg’s death, 471 Beacon was inherited by Richard C. Berman. He and his wife, Judith A. (Gaboda) Berman, lived in Nashua, New Hampshire. In March of 1998, he filed for (and subsequently received) permission to reduce the number of apartments from five to four by combining two apartments on the first floor. On August 12, 1999, Richard Berman transferred the property to himself and his wife as trustees of the CKF Trust, and on February 23, 2010, they transferred the property to themselves as individuals. On November 17, 2017, they transferred the property to the CKF LLC. 471 Beacon remained an apartment house, assessed as a four- to six-family dwelling, in 2017.